This appeasing mask hydrates, brightens, & prevents aging signs with one mask! Leach me latch on to your dry, dull, deteriorating skin - and feel it moisturize and fortify from within. The mask acts fast, burrowing its special nutrients into your skin - and your lines will refine, your dryness will vanish - and the mirror will reveal a beaming face once again! leach me (10pcs) was added to your shopping cart. For all skin types, especially for dry, dehydrated skin (all ages). 1. Use Leach Me 2 to 3 times weekly, after cleanser. 2. 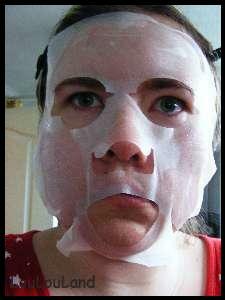 Remove protective sheet and place mask evenly on whole face for 20 to 30 minutes. 3. Remove the mask and gently massage excess serum into the skin. 5. Use the product immediately after opening. The mask quality is really good! It helps to sooth, moisturize and brighten my skin when my skin is sensitive. 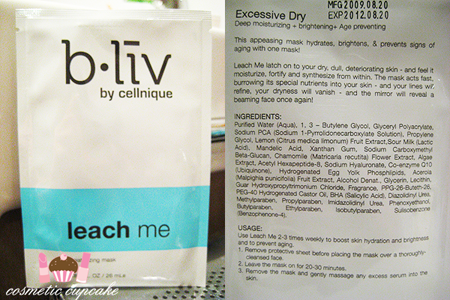 After used this mask , i feel my face is so smooth, bliv product is easy to absorb and moisture enough for my face. Good quality mask. Moisture. Hydrating and moisturizing. Feel hydrated and moisture. Good quality. My skin type: acne prone, combination, sensitive Hands down one of the best hydrating masks I've used and my skin always feel refreshed after using this. If you have dry skin you will absolutely love this. Not only does it restore moisture, if you wear a lot of makeup or have stressed skin, this is great for calming and treating your skin. I always go with a hydrating product no matter what other things I include in my skincare routine because ultimately, hydration will solve many of your skin's imperfections. There is lots of product on the mask so don't ever throw away the packaging when you've used it - there will be product left and I pat the remainder on my skin in the morning as part of my morning skincare routine. before have test few paper mask, but this mask is most good for me, after using this mask, i feel very moisturizing for my face. i will introduce to my friend. This is a really good mask. After i put it on my face for 30 mins, the mask is still contains lots of essence. I think b.liv's original silk mask does make different from other mask, the mask sheet is thick and contain high density of essence. 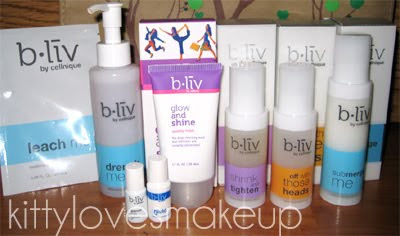 Will try out b.liv other ranges mask. A 3-in-1 hydrating mask, Leach Me moisturizes my skin gently. It is my enjoyable and relax session with my favourite Leach Me. I always awaiting for this session. I received this product to try and I must say....WOW! It is the first kind of mask that I've tried of this material and I was very surprised and pleased with the way it turned out. It is very moisturizing and the material that the mask is made out of is thick and feels divine! It's a luscious material that fit my face perfectly. After leaving it on for 20 minutes, my face felt renewed and moisturized. I was able to put on make up the next day on smooth skin and the foundation did not flake off as usual during the day. Regular treatments would help my dehydrated skin. I must say, I am very impressed!